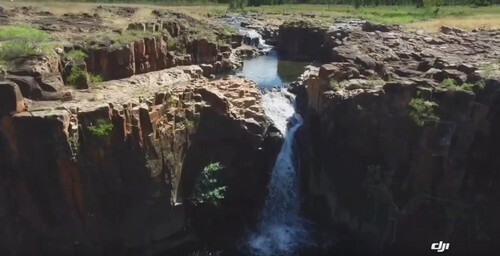 Kimberley and NT News: Gibb River Road open; Access to Wongalala Falls; Want to work on the Gibb? I hope you had a great Easter break! Yay, no more cyclones and no more big low pressure troughs by the looks of it. The past weeks have been comparatively uneventful, albeit not exactly dry. The weather is mostly sunny and both the west Kimberley and the far north have been getting very regular afternoon storms. Those are fairly small, isolated storms. They do not cause widespread flooding but they can drop a surprising amount of water so localised flooding can still happen and it's impossible to predict where exactly. If you want to keep an eye on what is happening, use this handy rainfall map on the BOM website. You can select the area that interests you and set the time period for 1 day, 1 week, 1 month or more. Very helpful. Oh, and by the way, day time temperatures can still reach into the fourties. One thing however is for sure: overall things are looking much better than anybody would have expected. As of March 27 the Gibb River Road is open all the way. It may sound like big news but it isn't. East of the Pentecost River the road is open for all vehicles, everything else is open for high clearance 4WD vehicles only. If you have a high clearance 4WD you can drive all the way from Wyndham to Derby. But I suspect most of you would not be content with just driving through, you'd probably like to see a few things on the way. And everything along the Gibb, all the gorges and station stays are still closed. And, if all goes well, then Windjana Gorge and Tunnel Creek may open as early as April 23. This is not a confirmed date yet, it is the hopeful estimate that the DPaW guys are currently working with. They also said that by mid/late next week they should be able to tell me more. I am not going to try to predict opening dates for the other dozens of stations and gorges. I don't think that is helping at the moment. What I will say is that it looks as if from late April/early May you should be able to have a great trip along the Gibb River Road. Not everything will be open, far from it, but what is open will be spectacular. "Trip of a lifetime. 2.5 weeks Darwin to Broome and return. Weather perfect. Beauty everywhere. Only downside was that Bell and Windjana gorges were off limits as the access roads had been washed out by late season rains. All tourist info centres failed to forewarn us of this. And the knock-on effect was that Mornington became quickly booked out, so we also missed out on Dimond and Sir John gorges. But because the region is blessed with a multitude of other gorges, waterfalls, pools, chasms, the Bungles etc, we never ran out of jaw-dropping sights to see. My wife, Tania and I plan to get back and do it all again. SOON. Anyone considering it but unsure, GO!! PS: Avoid swimming in Edith Falls and Wangi Falls. LARGE salties caught in both spots in March and April. Just because you will see plenty of mad European tourists swimming there doesn't mean it's safe." So there you have it. That was in 2017, but change the names of the places around a bit, and the comment sums up very well what you can expect early this year. As I let you know in the last newsletter, I will be going away on Friday, April 13, and I won't be sending out another newsletter before then. But if I find the time then I'll put up a short note with the most recent info (e.g. from the DPaW as mentioned above) on this page on my website. The Kalumburu guys just released a statement on their Facebook page that this season, for the first time, they will be giving tourists access to Wongalala Falls. It took time and effort to get the approval from all the traditional owners to make this possible and it is great that all of them have finally agreed. Please understand that this is a very special place that has been kept secret in the past. Only a handful of people a year got to see it. It is a big thing for the traditional owners to give us access to it. Also be clear that this is only a trial, the decision will be reviewed at the end of the season. Please treat Wongalala Falls with great respect, leave it better than you have found it, so that it can stay open in the future. So where or what is Wongalala Falls? It's a day trip, not a camping destination, with no facilities whatsoever. It's located 20km or about 1hr east of Kalumburu, behind the ridge that can be seen from town. Like in most places, the falls don't flow all year round but the pools are always there and you can swim year round. I have not been there myself yet. Few people have. I am not sure yet if I'll be able to make it up there this season, but after watching the video I'd certainly like to check it out myself! Do You Know A Good Mechanic Who Wants To Work On The Gibb? I am sure you have heard of Over the Range Tyres & Mechanical Repairs. 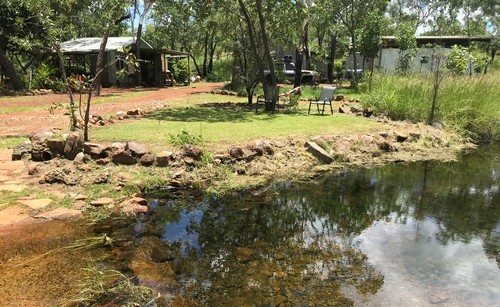 Neville and Leonie with their young daughter Mira live almost exactly half way along the Gibb River Road. 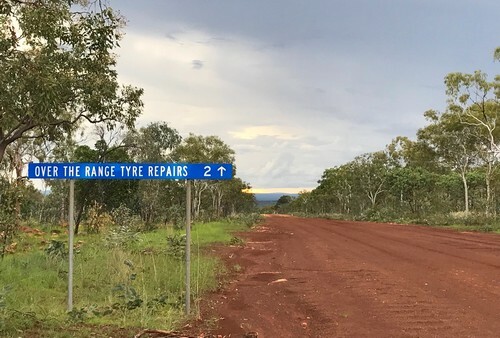 Neville Hernon has been "Helping people survive the Gibb River Road since 1999." Should you find yourself in any mechanical trouble while out there, Neville is your man! Over The Range is located 30km west of Mt. Barnett on the Phillips range. Adcock Gorge is on one side of the range and Galvans Gorge on the other. Kimberley living doesn't get much better than that. The Gibb is quite a bit busier these days than it was in 1999 so just as last season Neville needs another qualified mechanic out there to be able to keep up with the work. Do you happen to know someone who would like to work at Over the Range for the season? At a super nice location for super nice people? and ideally is self-sufficient with their own camper. Please contact Neville on 08 9191 7857. Alternatively you can email overtherangetyres AT gmail DOT com . We did a Kimberley trip 2 years ago but still love reading your newsletters as they bring back great memories. Sorry to hear of Monica’s vehicle break in and thanks for the advice but I would comment that not sure if locking a glove box helps. It happened to a friend of mine and the thieves just busted the lock so in addition to othes losses it cost over $400 for the entire glove box to be replaced! Good thought. I guess the best strategy really is the one Monica suggested in the last newsletter: Leave some fake "valuable items" in obvious places and hope the thieves will be content with that. Another interesting suggestion comes from Malcolm from Brisbane. Before I share it I want to point out that Malcolm strongly suggested that before I share his comments with you, I talk to a good 4WD repairer to get up to date info. I haven't had a chance to do that yet, so please take the below as an idea worth checking out yourself, and not as gospel! Too late now to help that poor couple who had their 4WD broken into. I feel her pain, hundreds of times leaving it alone and then someone destroys that trust, and what they took could have been life threatening. When I was exploring window tinting in 2008 (I think) I discovered that for a few dollars more you can buy and have fitted tint film that makes the glass unbreakable. I paid to have dark tint film (darkest legal colour) fitted to every glass pane in my Toyota Land Cruiser 200 series. The truck was filmed for a cooler truck, with less glare and added security. Once filmed the windows will not smash (that was what I was told). Doors in jeweller's shops etc have this sort of film (albeit clear film) so even a sledge hammer won't go thru them. We of course did not film the windscreen. As I understand it the windscreen in all recent cars is laminated can not be shattered like the old days, when it broke into small lumps (think 5mm cubes). As such, unless there is huge force on the windscreen, the glass cracks dramatically but doesn't allow access. You might have seen them intact on the side of the road in the outback. So if all other windows are film treated you are safe apart from surface damage. You just needed a pick to break the glass if you were inside and rolled over and needed to get out. My knowledge is old, so perhaps if you chat to your 4wd expert who looks after your car he will have current knowledge and clarify anything I have misunderstood. The glass breaking spike should be an in-car accessory (you might have seen them in the rail above/beside the window, on a cord in buses). In preparation for our adventures we had our two way radio concealed under the dash with a hidden plug in under the dash for the handpiece. Handpiece & anything of value was always hidden out of sight although the dark tint made viewing in difficult. The essential sat phone (only need one in a group) I kept in our rear sliding draws which were locked. Wonder if they would have forced them. Mind you, if we were walking we generally carried the sat phone with us. No sat phone out there can spell disaster, I imagine they don't think of that when they break in. I recall my wife saying I was paranoid concealing things in the truck. Reckon we were lucky. As always, although our remote outbacks travels are behind us, I admire your continuing contribution to everyone's welfare, enjoyment, trip timing and safety. Your advice has been so useful to us in our planning, exploring and travelling. What magnificent country and it is so much better if you know what to look out for. Take care with your travels. I already warned you that I will be away from April 13 - May 6. If you contact me during the next week it might already be Amit answering you, but until Friday I am still here to jump in and help if needed. A reader contacted me with a question only yesterday, saying that I "seem to know a lot more than most tourist places!" Here's the thing: None of what I tell you is a secret. When it comes to information about the weather, the roads and the parks, you can find all of that yourself by making use of the links and phone numbers you find in the appendix of Destination Kimberley (as well as Top End and Red Centre). Naturally, you'll hear from me again asap once I'm back. And if you are indeed going to be out there for an early season trip, we count on you to send us pictures and trip reports as soon as you can! 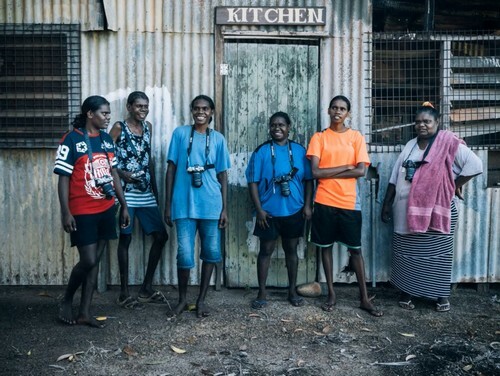 I'll leave you with this little video that show-cases some brilliant photos that local Kalumburu women took of the area during two workshops in 2017. I bet you did not expect photos of that quality. Happy travels and talk again soon!